Modular Cranes is dedicated to providing businesses across all industries with complete solutions to their hoist requirements. Our hoists are designed and manufactured using the latest technology and are selected because of their reliability and their durability. We provide the most operationally reliable electric hoists available in Australia. As part of our service offering, we guarantee that the most reputable models of wire rope hoists are available to our customers across Australia. Modular Cranes have assessed the many options from wire rope hoists manufacturers to select the most suitable equipment to meet the requirements of our clients. 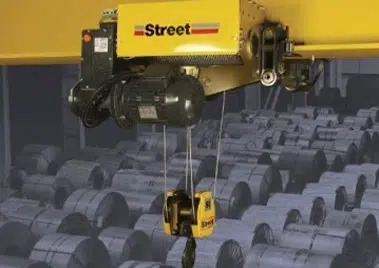 We offer the Street Cranes ZX electric wire rope hoists that provide unique benefits for the user. ZX epitomises intelligent design for easy load handling, impressive performance, and exceptional safety levels. There are three different electric wire rope hoists, including the fixed hoist, low headroom hoist for single girder cranes, and the top running hoist for double girder cranes. Thanks to the high-tensile wire and in-built safety measures, you can trust our wire rope hoists to successfully carry out lifting tasks with a firm focus on the safety of the operators and other employees.